In July 1975, OJIBWA departed Halifax for a three month deployment and work-up with the Royal Navy. The September 12th issue of Maritime Command Trident contained a substantial article about this time with the Royal Navy. Included was the photo and caption seen here. Recently, we asked retired submariner Gilles Poirier about the photo and he sent along the story you see below. Captain J.F. 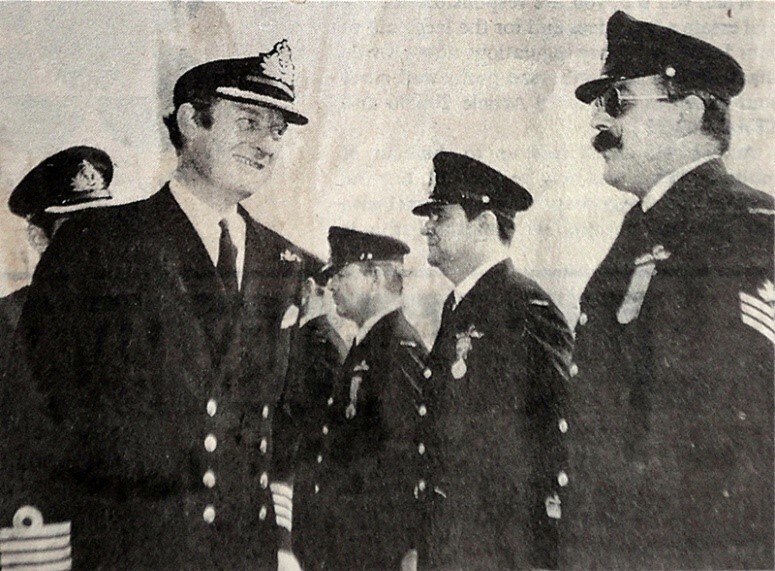 Woodward, RN, Captain Submarine Training, inspecting the ship's company at Divisions marking the shore phase of the Work-ups, expresses disbelief at the magnificence of P2 G. Poirier's mustache. Second from Right: P2 B.R. Farrell, second from Left: C2R.J. Ward. Here is a good story about this mustache. Like I told you, I had to use mustache wax in order to keep it above the corner of my lips. This wax came in a small tube. It was basically a mixture of wax and soap. It worked beautifully but it had one big disadvantage - it was not water resistant because of the soap content. In the rain or while taking a shower, the wax would simply "melt away". One day while I was fueling the submarine in Halifax, I was standing on the after casing in a real downpour. I knew that after a few minutes my mustache would simply droop down below my chin (it was that long). Then I noticed that the engineering officer (Lt. John Smith) was walking back on board the submarine. He hated that mustache; to him I was a rebel. He spotted the fact that it was drooping. So he basically ran to the after casing knowing that finally he had me! As I saw him coming around the fin, I knew I was doomed. So, I quickly stuffed my whole mustache inside my mouth. By the time he got to me, I was still within regulation since there was nothing below the corner of my lips. Mind you I could not talk since I had a mouthful of hair…! He just stood there, stomped his feet for a few second and left. Another win for me…! It was a close call mind you. Chief Engine Room Artificer (CERA) Ret’d. 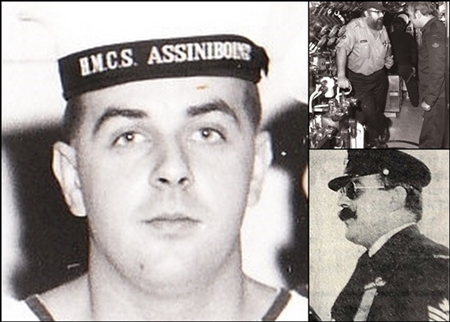 Gilles joined the Royal Canadian Navy in 1962 and retired 25 years later. More than twenty of those years were spent on board our Canadian Oberon class submarines. He served on Onondaga, Ojibwa and Okanagan starting as a young leading seaman in the engineering department and finished as chief engineer (CERA) in 1986. After submarines, he joined the work force of the Navy dockyard in Halifax and continued to look after the welfare of our submarines till his retirement in 2006. From the very early days of Project Ojibwa, from his home in Nova Scotia, Gilles has helped us to understand the inner workings of the Oberon class submarines in true Sea Daddy fashion – always encouraging, setting us straight when we might not have grasped some element and making certain we get it right. He is the first to admit that there is more than a little rebel in him – a trait he shares with many submariners. Let’s just say we agree after reading that he was the last sailor in the RCN to shave off his beard – his mustache is another great story.